Vitamins are completely natural, organic molecules that are essential to sustain all lives. Whether we talk about human or animal well being, these micronutrients support healthy growth, a well-functioning metabolism and nervous system, and basically all of our organs. Vitamins, however, cannot be manufactured by our bodies – we need to obtain them from a well-balanced diet, and the same goes for our pets. 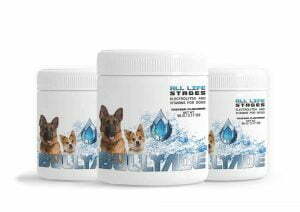 To provide our animal friends with all the essential micronutrients for a healthy body and mind, we developed Bullyade, a novel supplement suitable for dogs in all ages and size. Let’s see how Bullyade can benefit your pet’s health on a daily basis! Bullyade is specifically designed for dogs, and effectively prevents nutritional deficiencies (given as part of a healthy and balanced diet). Ensuring your dog gets all micronutrients needed increases their chances for a longer, happier and healthier life. 3. Bullyade ensures a faster recovery from dehydration due to heat, exhaustion or illness. It surely comes as no surprise that water and electrolytes play a vital role in all bodies, and dogs are no exception. Dehydration means a serious threat to animal and human health, potentially leading to kidney and other organ failures, and in the most serious cases, to death. 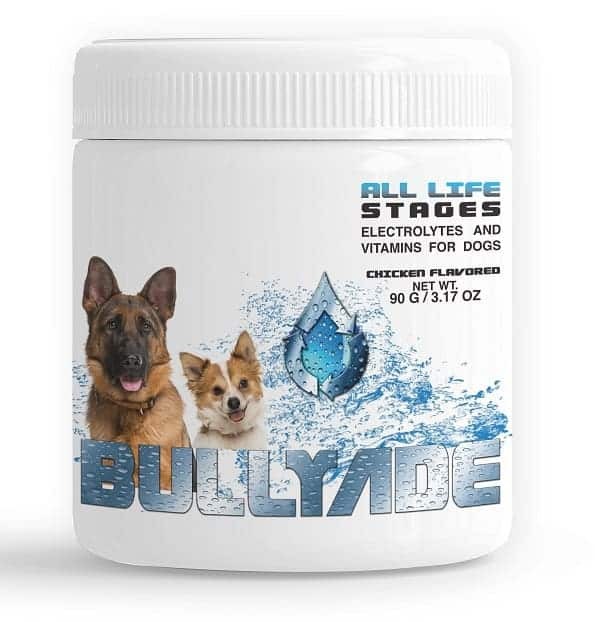 To prevent or recover from a significant loss of water and electrolytes (such as potassium or sodium), Bullyade is a perfect choice and effective solution for your beloved friend. 4. Our supplement is a great addition to home-made dog treats. Whether you decide to DIY some delicious biscuits or a pack of juicy frozen treats (perfect in the summer heat! ), adding Bullyade makes any tasty bites rich in vitamins and minerals. 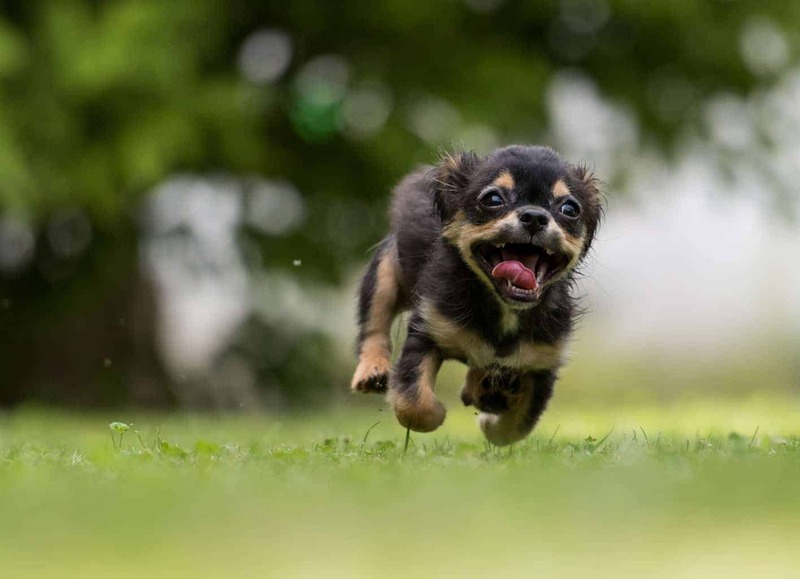 The Canine parvovirus (known as parvo), a highly contagious illness mainly affecting dogs, is every pet owner’s nightmare. Although vaccination is effective and widely recommended at an early age, it sadly doesn’t provide complete protection. Parvo mostly targets puppies and young dogs, developing an infectious gastrointestinal illness which, if untreated, is potentially fatal. Luckily, with immediate veterinary attention, accurate diagnosis, quarantine, and efficient medical treatment, it is mostly curable. Supportive fluids, medication, and sufficient nutrition are essential for a fast recovery – adding Bullyade to this routine effectively strengthens your dog’s immune system and is recommended by vets worldwide. 6. It can be used by all breeds and ages! Regardless of what shape and size your pet comes in. Bullyade provides high-quality nutrition for every life stage. Our supplement is also used by working dogs, competition dogs, military and police dogs, as well as in veterinary care. 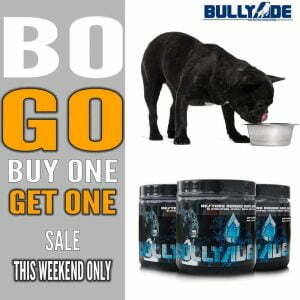 Bullyade comes with 45 servings per bottle for a price that easily beats the market. It also combines all necessary vitamins, electrolytes and minerals which helps you cut costs on other supplements. 8. Bullyade can be added to your pet's food to ensure they are receiving all their vital nutrients. 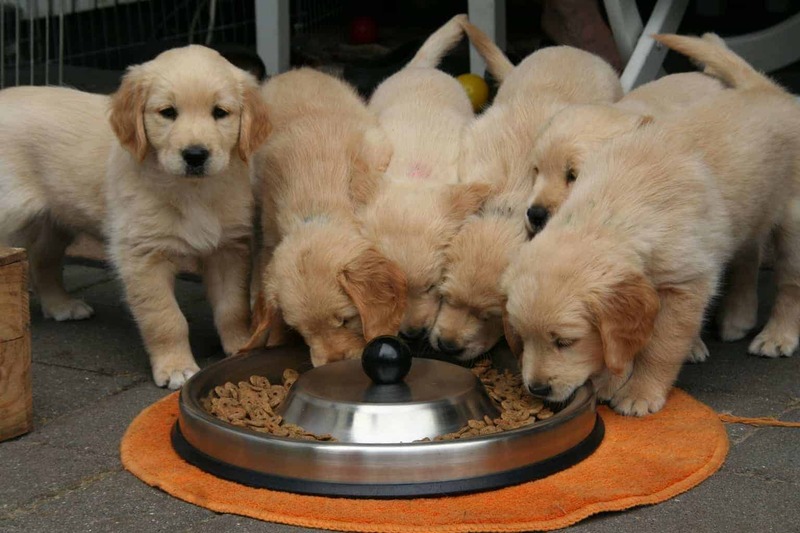 Just pour right on top of your dog’s food to ensure their required vitamin intake is covered! As our supplement comes in two delicious flavors, adding it to dry or wet food won’t cause any unpleasant smell or taste which would take your pet’s appetite. 9. No more pills for your elderly dog: Bullyade makes it easy for older pets to receive their daily dose of multivitamin without the hassle. We all know our animal friends often don’t prefer taking pills, and for their comfort, our product does not only offer a tasty solution but also makes taking supplements convenient and quick. 10. Bullyade is made in an FDA approved facility located in the United States and is recommended by vets around the world. The manufacturer of Bullyade is GMP (Good Manufacturing Practice) Certified, meaning the quality of our products meet the highest standards. Developed and trusted by professionals, our supplement is tailor-made to your dog’s needs, whichever life stage they are in.